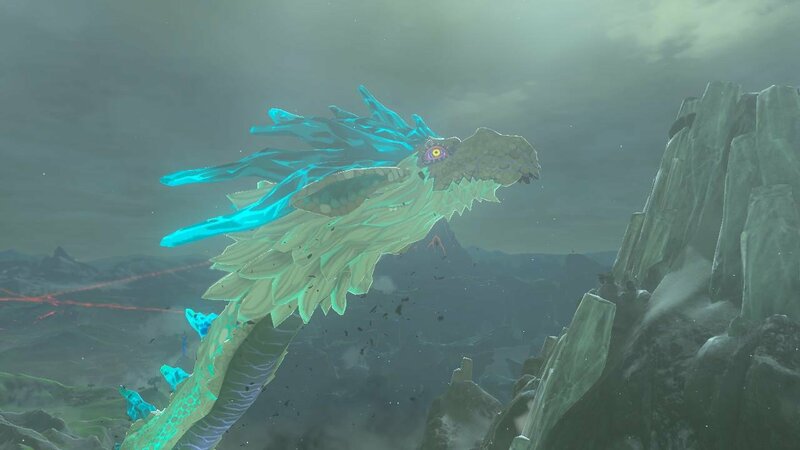 When I first saw one of the dragons in Breath of the Wild, I honestly thought that he was just there for show, not tell. The same cannot be said for the Lynels though since I instantly regretted running into one. According to a couple of Breath of the Wild producers, there’s a reason why these creatures’ presence is truly felt when encountering them. Slate: I’d like to talk a little bit about a couple of monsters. To start with: dragons. When you first encounter a dragon, it’s a very unique moment in the game and not at all what you’d expect based on what you’ve seen from dragons in past games. Normally if you come across a dragon, you can expect a big fight or maybe it’s a tough fight you have to run away from. But when you encounter a dragon in Breath of the Wild, it’s almost peaceful. It’s a very unique experience, and I wondered what the inspiration was behind the use of dragons in this game. Fujibayashi: As for dragons, just as I spoke earlier, we wanted to incorporate something that could be seen afar, kind of like the Divine Beasts. So we thought we definitely accomplished that with the Divine Beasts, but we also thought we could incorporate a little more and that would be great. We wanted to incorporate something that was a little bit Romantic. And maybe it’s because I’m Japanese, or the team was Japanese, but instead of having that battle theme or something that will have an adrenaline rush, we thought something mystical, maybe something serene and kind of a different experience would make the adventure for the player be more exciting. And that’s why we decided not to make it necessarily like a battle. And addressing the idea of how Japanese people portray dragons, we wanted to incorporate that feel of godliness or maybe something more serene. Aonuma: In lots of Japanese folklore, there’s often stories where dragons are basically incarnations of gods. So, I think that might be part of the reason why we incorporated that in this game. Slate: Now the exact opposite of a serene feeling is when you encounter a Lynel in the game, which is very tense, almost like a boss battle. And in fact, they can even be quite a bit more challenging than certain bosses, I think. I wonder what the inspiration there was. And was this meant to be an ultimate challenge for the player? Fujibayashi: We thought of Lynels because we definitely wanted to incorporate a strong enemy. But also, we didn’t want to make it so the player goes to a room, and then there’s a boss fight, kind of a set-up scenario. We wanted to make sure that in Breath of the Wild, it was an adventure, so players would randomly encounter these, and suddenly have to be adjusting their situation and have that feel of adventure. So when we were thinking about strong enemies, we remembered that in the first Zelda game, Lynels were known to be the strongest one. And Lynels never appeared in other Zelda games, so we thought we would refine the design, and it would be a perfect fit for Breath of the Wild. What do you folks think? Were your first encounters with these giant beasts something you’ll never forget? Let us know in the comments below.